Members of the award winning design team are (from left) Brian Orland, Rachel Shields, Alfie Vick and Jon Calabria (Photo courtesy of the College of Environment and Design). 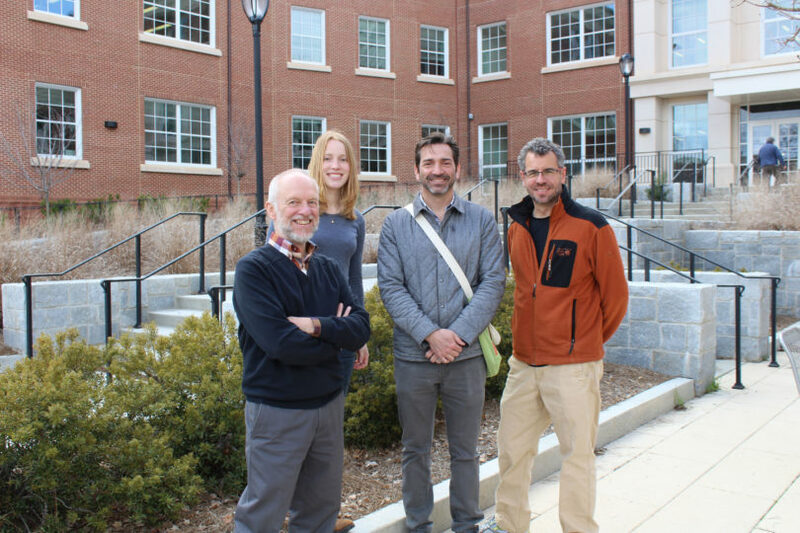 A design team from the College of Environment and Design recently took home an honor award for research at this year’s awards ceremony of the Georgia chapter of the American Society of Landscape Architects. Faculty members Jon Calabria, Brian Orland and Alfie Vick, research fellows chosen by the Landscape Architecture Foundation, and MLA candidate Rachel Shields were part of a cohort of landscape architects working with HDR Inc., an Atlanta environmental engineering firm, on a project for Atlanta’s historic Fourth Ward. HDR designed the site while the CED team ran evaluations on its performance. The yearlong study identified and developed methods to quantify environmental, economic and social benefits for this high-performing urban park in downtown Atlanta. The Georgia chapter of the American Society of Landscape Architects sponsors the annual competition for practitioners and academics working in Georgia. This year’s gala announcing the award was held March 9 in Buckhead, Atlanta. With the hard work of Shields, the team also evaluated the UGA Science Center. Tripp Lowe at the university’s Warnell School of Forestry and Natural Resources had input as well. Using a drone, Lowe flew and analyzed aerial photography of the sites. Briefs for both case studies were peer reviewed, assigned a Digital Object Identifier and are accessible online, under the methodology section at https://www.landscapeperformance.org/case-study-briefs/fourth-ward-park. The Historic Fourth Ward project was among eight exemplary landscape projects for the Landscape Foundation’s 2018 Case Study Investigation program. Now in its ninth year, the CSI program is a research collaboration that matches LAF-funded faculty/student research teams with design firms to measure and document the benefits of high-performing landscapes. Teams conduct research and document their projects through images and narratives that include background information, descriptions of sustainable features and lessons learned. The resulting case study briefs are published in LAF’s award-winning Landscape Performance Series database of more than 150 projects.